THE # 2 SLEIGHBELL MEASURES 1 5/8 ACROSS. 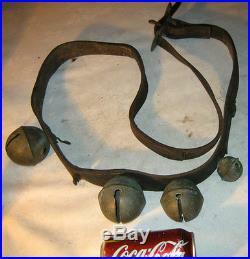 TWO SLEIGHBELLS EACH MEASURE 2 5/8 ACROSS. 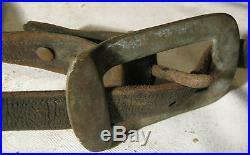 THE THICK LEATHER ANTIQUE STRAP HAS A ORIGINAL BUCKLE AS SHOWN. THEY HAVE NORMAL AGE WEAR AS SHOWN. THE LEATHER BELT HAS A TEAR ON ONE SIDE AS SHOWN. THEY HAVE NOT BEEN WASHED, CLEANED, OR POLISHED. NOTE; ADDITIONAL INFORMATION FOUND ON LINE, HOPE IT HELPS... 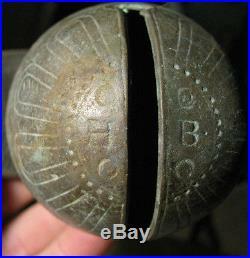 This sleigh bell is an antique brass sleigh bell signed, HB. From what I've read online, the maker could be either Hiram or Hubbard Barton from East Hampton, Connecticut. I do not know the exact manufacture date of this sleigh bell, but Classic Bells states that the Barton brothers were manufacturing bells in the 1800s. Please View My Other Auctions, Thank You! Please check it out, We have many Antiques listed. Tape, bubble wrap, paper, packing peanuts, etc... We do our best to describe each item completely and post clear images for your review..... Thank You for viewing and Have a Wonderful Day! 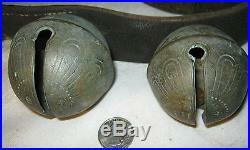 ANTIQUE EQUESTRIAN COUNTRY PRIMITIVE FARM HORSE BRASS SLEIGH BELL SET" is in sale since Monday, August 05, 2013. This item is in the category "Antiques\Primitives".